So, there's a lot of "global warming is a myth" rhetoric going around recently. Most of it is fairly unconvincing to me, even though it's very tempting for me to want to believe. But, this is the first piece of evidence I've read in a while that is actually fairly compelling - the fact that the planet Mars is experiencing a global warming of their own. 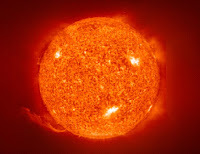 A few months ago, I read an article that theorized that the sun was getting hotter, a process called 'global irradiance' and therefore, could be responsible for the majority of our warming pattern on Earth. Turns out that carbon dioxide "ice caps" on Mars have been diminishing for the past three summers. Obviously, humans are not the source of this problem on Mars. Could it be that big flaming ball my bronzen skin worships?